Jeera is one of my favorite spices, especially when combined with rice it imparts a very unique and delicious flavor. 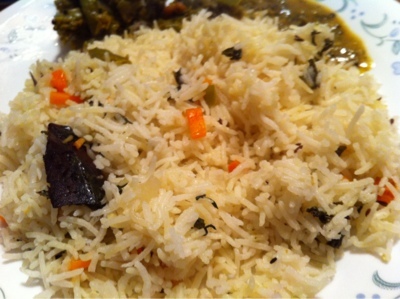 My mother used to prepare this rice very often, we used to have it with curd or boondi. Yes, my favorite combo with jeera rice is curd and boondi. Try it once and you will enjoy it for sure! Wash rice and add 6cups of water and salt to taste. Soak for 20min for better results or you can start cooking immediately. I cooked in a rice cooker, if you are cooking out side you can do the following procedure in the vessel you are cooking rice. Heat 2tbsp of oil in a pan and add cumin, cinnamon, cardamon, bay leaf and clove. Saute them for 1min under medium flame and add ginger, garlic paste, green chili, carrot and saute till carrot are half done. Then add pudina/ mint leaves and cilantro. When mint leaves are done turnoff the stove and add this mixture to the rice soaked and mix well. Turn on the rice cooker and cook like a normal rice. When it is cooking your house will be filled with all mint and jeera flavors. If you do not have pudina/mint it is OK you can cook without it!!! 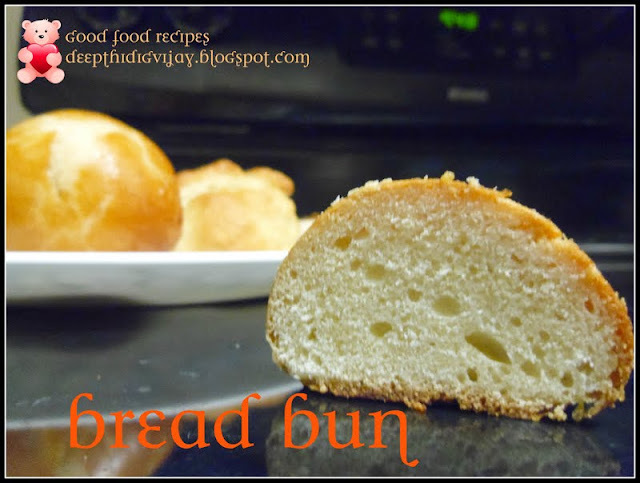 Such a comforting dish:-) Yummy! This is like a nice mildly flavoured vegetable rice. Can be had with anything or just plain. Nice. 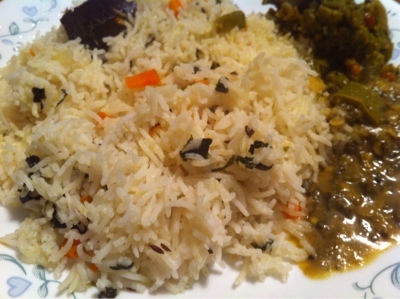 Appealing and flavorful rice !! This looks really, really good!! Thank you all for all your wonderful comments!!! !